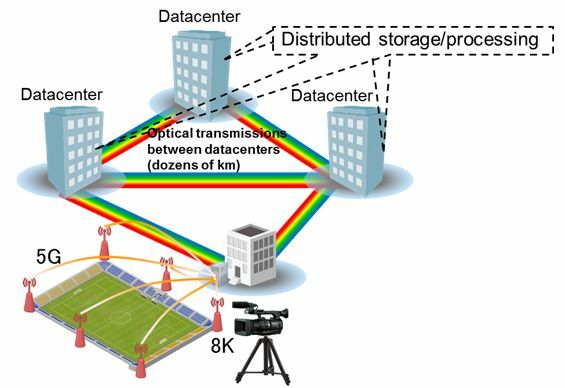 Kawasaki, Japan, September 19, 2018: Fujitsu Laboratories Ltd. today announced that it has developed an ultra-high capacity wavelength-division multiplexing system that considerably expands the transmission capacity of optical fibers in optical networks connecting datacenters. The new technology achieves this without the deployment of new transceivers dedicated to new wavelength. Previously, in order to expand transmission capacity between datacenters, operators had to either increase the number of optical fibers being used, or they needed receivers supporting each band of wavelengths. Now, Fujitsu Laboratories has developed the world's first broadband wavelength conversion technology that can batch convert C-band(1) optical signals to new wavelength bands, including L-band and S-band, reconverting them back to the original C-band when received. Upon development of a system that converts optical signals in C-band to L- and S-bands before multiplexing and transmitting them utilizing this innovative technology, Fujitsu Laboratories successfully demonstrated in principle that transmission capacity could be tripled. This allows datacenter operators to use existing equipment as-is to raise the efficiency of optical fiber utilization and thereby expand transmission capacity. This promises to eliminate the kind of network bottlenecks that could pose challenges for high-volume users that need to store, back up, or perform parallel analysis on large volumes of data distributed between multiple datacenters. This includes cases that many expect to increase dramatically in the near future, such as transfers of unstructured data including 8K video material and device log information connected through 5G networks. Expanding transmission capacities between datacenters can be accomplished by increasing the number of optical fibers, however, additional fees would be assessed based on the number of optical fibers used, presenting a significant cost burden for operators. On the other hand, what could also be considered is the simultaneous use of new wavelength bands outside the C-band. 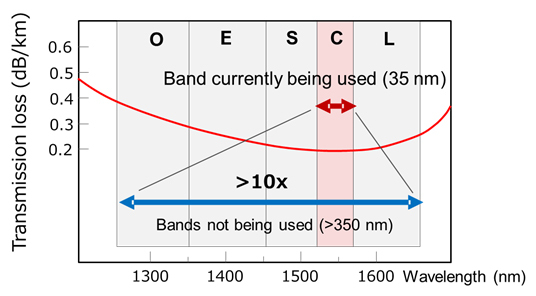 Optical networks generally use the C-band for its good transmission performance, but for medium-distance transmissions of several dozen kilometers between datacenters, the impact of transmission loss with the use of other wavelength bands, such as the L-band or the S-band, is seen as quite small, and consideration may also be given to using these wavelength bands. However, this method would necessitate the separate development of transceivers that could support each band. To address these challenges, Fujitsu Laboratories developed an ultra-large transmission capacity optical wavelength-division multiplexing system (a patent application was filed) that batch converts C-band optical signals output by a transmitter into new wavelengths for transmission, and then converts them back to the original wavelength band before sending them to the receiver. First, the C-band optical signal is combined with two pump lights(2) , generating a signal with mixed wavelength. The pump lights change the signal’s refractive index of a nonlinear optical medium which the signal passes through and outputs converted signals at a different wavelength. A similar principle is used on the receiver side to return the transmitted optical signal to the C-band. With this newly developed technology, it becomes possible to convert an optical signal to an arbitrary wavelength band efficiently by choosing the wavelengths of two pump lights, based on the chromatic dispersion characteristics of various nonlinear optical media. Additionally, this technology can reduce the noise superimposed on the signal after wavelength conversion by synchronously controlling the pump lights. This means it can simultaneously convert the signal’s wavelength efficiently while maximizing the quality of the optical signal. Using this technology, Fujitsu Laboratories created a prototype system to convert an optical signal in C-band to L- and S-bands, and then multiplexed them for transmission, successfully confirming in principle that this technology could triple available wavelength without the use of transceivers for each new wavelength band. Using this technology, transmissions using an even greater variety of different bands become possible, allowing for the expansion of transmission capacity from two to 10 times, as needed. In addition to this technology, datacenter operators can immediately make use of new C-band transceivers that will be developed going forward in wavelength bands outside the C-band. C-band - A wavelength band used for optical transmissions defined by ITU-T, the Telecommunication Standardization Sector of the International Telecommunication Union. The C-band refers to wavelengths of 1,530-1,565 nm, while the L-band covers 1,565-1,625 nm and the S-band covers 1,460-1,530 nm. Pump light - A light that induce modulation on optical signal through refractive index change in nonlinear optical media.